Outlook is one of the best e-mail clients around and many corporates use outlook as their default e-mail handling client. If you are a regular Outlook user then you would know how important is the .pst file as it stores all the e-mail messages in your local hard drive. Sometimes your .pst file may get corrupted or damaged and you may not be able to access all your e-mails that were stored in your .pst file. 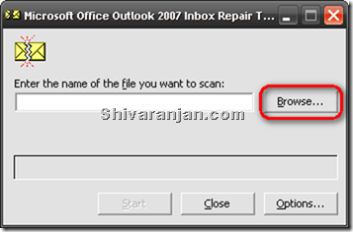 How to Repair Outlook .pst file? 1. 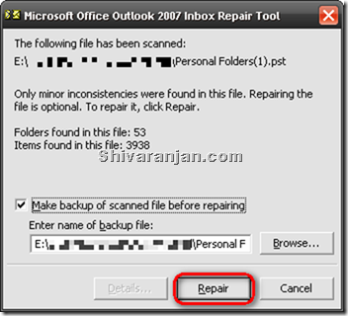 Outlook has got its own repair tool called “Inbox Repair Tool“. Go to C:\Program Files\Microsoft Office\Office12\ (this path is valid for Outlook 2007) and open the file named “scanpst.exe”. 2. Now select the .pst file that needs to be repaired using the “Browse” button. 3. Once you select the .pst file start the scan process and you should see the scanning progress. 4. After the scanning process gets completed you would be prompted to repair the .pst file, here you also have an option of backing up the .pst file before the repair process starts. Start the repair process by clicking on the “Repair” button. 5. The repairing may take a while to complete depending on the size of your .pst. On completion of this process you should be able to access all your e-mails that were stored in your .pst file. If anything goes wrong during the repair process you need not worry as you still have your old .pst that was backed up before the repair process started. Though there are different tools available to repair the .pst file but I would say that this one of the best. see this weblog on regular basis to get updated from most recent gossip. Even $10 per survey (ten minutes duration).